As a measure to curb the continuous increase of measles cases in the country, the Philippine Red Cross has begun to vaccinate children in Olongapo City. The latest mass vaccination drive carries more significance as it also commences PRC’s community-based measles control program in Central Luzon, in partnership with the Department of Health (DOH) and local health units. PRC, under the leadership of Chairman Richard Gordon, has been working closely with DOH to counter the immunization gap in the Philippines. More than 8,440 cases of measles – including 136 deaths from the disease – have been recorded in several regions of the Philippines, including the capital city Manila. 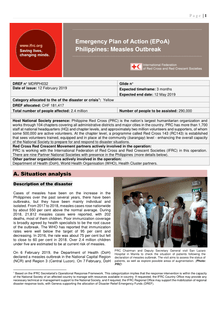 In response, the authorities are working with the Philippine Red Cross and the World Health Organization to ramp up public information campaigns and vaccination activities in Metro Manila, Central Luzon, and Mindoro, Marinduque, Romblon and Palawan. The Red Cross is also employing interventions to increase vaccine coverage and care and support for people currently in hospitals. 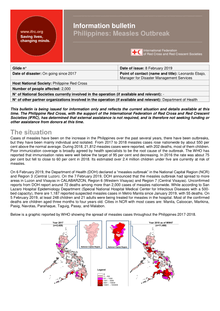 This bulletin is being issued for information only and reflects the current situation and details available at this time. 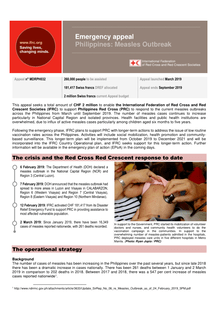 The Philippine Red Cross, with the support of the International Federation of Red Cross and Red Crescent Societies (IFRC), has determined that external assistance is not required, and is therefore not seeking funding or other assistance from donors at this time.